When I found out Chicago four-piece the Blissters had titled one of its EPs "I Love New Wave" I was more than happy to give the band a listen because, well, I love it, too. I'm very glad I did. The Blissters have been around since 2004 and draw on classic new wave and power pop sounds, playing melodic guitar rock infused with keys and synths and driven by traded off male and female vocals. This all adds up to something that sounds sort of like a cross between the Go-Go's and the Cars with current new wave revival acts such as the Sounds and the Killers thrown into the mix. Under the "influences" section on their MySpace page, though, you'll find everything from Pixies to the Clash to the Spice Girls (yes, the Spice Girls), so you'll have to decide for yourself. 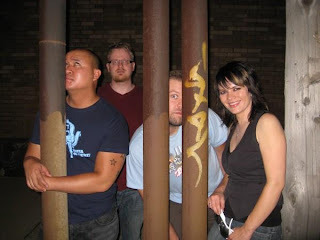 Last year the band won the Starbucks Avant-Grande Music Contest with the track "Just Like You," which led to increased local and international radio play and live shows. The song is worthy of its honor, boasting an infectious melody and memorable vocals. Singer and guitarist Erica Coriglione, who shares lead vocals duties with band mates Arnold Madlangbayan and John Darragh, has a very appealing rough-and-ready-yet-tuneful delivery that helps to give the tracks some extra edge for a nice balance of pop and rock. The Blissters are currently recording a full-length album, and if their music to date is any indication of what to expect, it will definitely be one to watch out for. You can check out the band live on September 17 at the Bottom Lounge. To get a taste of their sound, visit them on MySpace and check out this music video for one of their recently-recorded tunes, "Wet Reckless."